Notes: No installer - just unzip and run. On intial screen, third button from right will start benchmark. 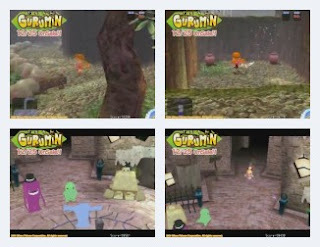 Gurumin is a third-person action adventure starring Parin, a girl who must rid an alternate world of its monsters. Originally for Windows, but ported to PSP in 2006. The benchmark is a level of the game, played by the computer. Everything is in-game: music, sound effects, voice acting, graphics. Nice art direction with cute characters. Runs at 640x480 only. Will loop until you quit. Long running time. Recommended.